Karl Wilhelm Friedrich (later: von) Schlegel (March 10, 1772 - January 12, 1829) was a German poet, critic and scholar, and a founder of German Romanticism. His study of literature, Greek antiquity, art and philosophy gave him a broad foundation, from which he developed seminal ideas on comparative and historical literary criticism, and on aesthetics. A quarterly journal, Athenäum, founded in 1798 by Freidrich von Schlegel and his elder brother, August Wilhelm Schlegel, articulated the principles and ideas of the early Romantic movement and drew many contemporary poets and writers into a loose association embodying these ideals. Schlegel wrote fiction and poetry, but his most important works were his literary criticism and his lectures on comparative literature. He developed a style in which the criticism itself became a literary work of art. Schelgel also wrote works on political philosophy, philosophy of relgion, and the philosophy of language as well as works on aesthetics. The philosophical contributions of early German Romanticists including Schlegel, Holderlin, and Novalis have been increasingly recognized in recent years by the philosophical community. Schlegel’s Über die Sprache und Weisheit der Indier (On the Language and Wisdom of India, 1808) was a pioneering work in comparative Indo-European linguistics and comparative philology. Friedrich von Schlegel was born in Hanover, Germany, on March 10, 1772, the youngest of seven children. At the age of fifteen, he began an apprenticeship with a banker in Leipzig. However, the work did not interest him and in 1790 he entered the University of Göttingen, where he studied law for a year. He then went to the University of Leipzig, where he studied philology, art and the history of ancient literature. He became especially interested in Greek antiquity, believing that Greek philosophy and culture were necessary to a complete education. At Leipzig he befriended Novalis. In 1794 Schlegel moved to Dresden, where he studied literature and culture of antiquity, and spent time visiting the art collections. In 1797 he published an essay, On the Study of Greek Poetry, which was intended as the introduction to a much larger work, The Greeks and Romans (Die Griechen und Römer), also published in 1797. This was followed by the suggestive Geschichte der Poesie der Griechen und Römer (The History of the Poetry of the Greeks and Romans) in 1798. Freidrich settled with his brother Augustine in Jena, then moved to Berlin where he formed a friendship with his future wife, Dorothea Veit, the daughter of Moses Mendelssohn and mother of Philipp Veit. In 1800 he returned to Jena where he lectured as a Privatdozent at the university for a year. While in Jena he he founded with his brother the quarterly Athenäum, a voice for the early Romantic movement, and was the editor of the magazine from 1798 to 1800, contributing aphorisms and essays stating the principles of the Romantic school. He also wrote Lucinde (1799), an unfinished semi-autobiographical romance, making an interesting attempt to transfer to practical ethics the Romantic demand for complete individual freedom; and Alarcos, a tragedy (1802) in which, without much success, he combined romantic and classical elements. From 1797 Schlegel contributed to Deutschland and Der Deutsche Merkur. In 1800 Schlegel published his most comprehensive work on romantic theory, Gespräch Über Die Poesie, in which he idnetified Dante, Miguel de Cervantes and William Shakespeare as the major figures of poetry. In 1802 he went to Dresden and then to Paris, where he studied Sanskrit, founded the journal “Europa” in 1803, and lectured on philosophy. In 1804 he married Dorothea, who had divorced her husband and converted to Protestantism, and they moved to Cologne. In 1808, he published his epoch-making book, Über die Sprache und Weisheit der Indier (On the Language and Wisdom of India). 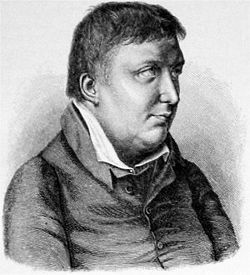 In 1808 he and Dorothea converted to Catholicism and he began to synthesize his concept of Romanticism with the ideals of medieval Christianity. The couple moved to Vienna, where Schlegel joined the Austrian Foreign Office. In 1809, he was appointed imperial court secretary at the headquarters of the archduke Charles and became a spokesman for the anti-Napoleonic movement to liberate Germany. He accompanied Charles to war, writing proclamations against Napoleon and editing the army newspaper. While in Vienna in 1811, Schlegel began a series of lectures on modern history, which were published as Über die neuere Geschichte (On the New History, 1811) and the following year a series on literature, published as Geschichte der alten und neuen Literatur (On old and new literature, 1815). Meanwhile he had published his collected Geschichte (Histories, 1809). From 1815 to 1818 Schlegel resided at Frankfort as councillor of legation in the Austrian embassy at the Frankfurt. He then accompanied Metternich to Italy, visiting Rome at the request of his wife. After his return to Vienna from Frankfurt he edited the right-wing Catholic journal Concordia (1820-1823), promoting the idea of a Christian state; his attack on the liberal ideals which he had previously cherished caused a breach with his brother. He prepared an edition of his Sämtliche Werke (Collected Works), and delivered lectures, which were republished in his Philosophie des Lebens (Philosophy of Life, 1828) and in his Philosophie der Geschichte (Philosophy of History, 1829). In 1828 he began another series of lectures at Dresden on the philosophy of speech and words, but died there of a stroke on January 11, 1829. A permanent place in the history of German literature belongs to Friedrich Schlegel and his brother August Wilhelm as the critical leaders of the Romantic school, which derived from them most of its governing ideas as to the characteristics of the Middle Ages, and as to the methods of literary expression. Of the two brothers, Friedrich was unquestionably the more original genius. He was the real founder of the Romantic school; more than any other member of the school, he proposed the revolutionizing and germinating ideas which profoundly influenced the development of German literature at the beginning of the nineteenth century. Schlegel wrote poetry and fiction, but his most important work was his literary criticism and his success in uniting similarly-minded friends, such as Tieck, Novalis, and Schleiermacher in the "School of Romanticism" (1798). In 1805-6 he published "Poetisches Tagebuch," which in addition to small lyrical pieces contains the epic "Roland;" three years later he published another book of poetry, "Gedichte" (Berlin, 1809). He later condemned his own unfinished romance, "Luzinde." "Athenaum," the journal which Schlegel and his brother August Wilhelm established in 1798 to spread the principles of the new Romantic school, was eventually abandoned, but its pages gave form to the principles and goals of Romanticism. Schlegel’s works of lasting importance "Ueber die Sprache und Weisheit der Inder" (On the Language and Wisdom of India, Heidelberg, 1808; tr. into French, Paris, 1837), and "Die Geschichte der alten and neuen Literatur" (On Old and New Literature, Vienna, 1815, tr. into French, Parish, 1829), both of which introduced seminal ideas which later developed into broad fields of study. Friedrich Schlegel's wife, Dorothea, was the author of an unfinished romance, Florentin (180), a Sammlung romantischer Dichtungen des Mittelalters (Collection of Romantic Writings of the Middle Ages, 2 vols., 1804), a version of Lother und Maller (1805), and a translation of Madame de Staël's Corinne (1807-1808)—all of which were issued under her husband's name. By her first marriage she had a son, Philipp Veit, who became an eminent painter. Schlegel’s broad range of interests, particularly in literature, art and antiquities, constantly suggested new ideas and theories to him. His conception of a universal, historical and comparative study of literature has had a profound influence on modern literary criticism. Schlegel encouraged the synthesis of different literary forms and suggested the idea of romantic irony, the difference between an author’s idea and the work he actually creates. Influenced by the philosophy of J.G. Fichte, he argued that poetry should be at once philosophical and mythological, ironic and religious. In writing literary criticism, Schlegel strove, not to reveal objective truths, but to write prose that was in itself a work of art. The philosophical importance of German Romanticism has been increasingly recognized in recent years by the philosophical community. The movement is seen as both a criticism of and an internal development within German Idealism. Schlegel was attracted by the philosophies of Fichte, Spinoza, Kant and others, and produced works on social political philosophy, philosophy of life, philosophy of religion, and philosophy of language, as well as works on aesthetics. The precise details of the philosophical contributions of Schlegel, Novalis, Hölderlin, and others are being studied by contemporary scholars. ↑ Stefan Arvidsson. Aryan Idols, 2006. Eichner, Hans. Friedrich Schlegel. New York: Twayne Publishers, 1970. Lohner, Edgar (ed.). Ludwig Tieck und die Brüder Schlegel. Briefe . München: 1972. Friedrich Schlegel, The Stanford Encyclopedia of Philosophy. Romanticism: Friedrich Schlegel: Excerpts from Selected Works (1799-1804), German History in Documents and Images. Friedrich von Schlegel, Catholic Encyclopedia. History of "Karl Wilhelm Friedrich Von Schlegel"
This page was last modified on 13 April 2018, at 14:19.